Synopsis: Callum Hunt's summer break isn't like the other kids'. His closest companion is a Chaos-ridden wolf, Havoc. His father suspects him of being secretly evil. And, of course, most kids aren't heading back to the magical world of the Magisterium in the fall. It's not easy for Call...and it gets even harder after he checks out his basement and discovers that his dad might be trying to destroy both him and Havoc. Call escapes to the Magisterium—but things only intensify there. 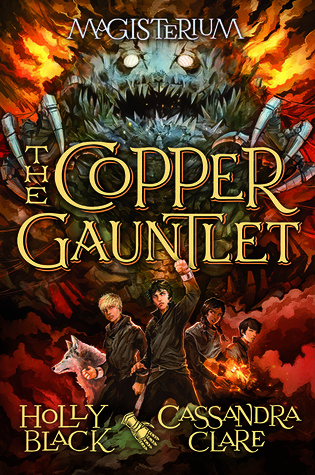 The Alkahest—a copper gauntlet capable of separating certain magicians from their magic—has been stolen. And in their search to discover the culprit, Call and his friends Aaron and Tamara awaken the attention of some very dangerous foes—and get closer to an even more dangerous truth. As the mysteries of the Magisterium deepen and widen, bestselling authors Holly Black and Cassandra Clare take readers on an extraordinary journey through one boy's conflict—and a whole world's fate. Callum Hunt's summer break from the Magisterium is much harder than other kids—with taking care of Havoc, his Chaos-ridden wolf, and having to prepare for the Magisterium once again—but everything changes when he finds out that his dad might be trying to kill him. With nowhere else to go, he tries to escape to the Magisterium, but everything only gets worse there. Finally, Call and his friends—Tamara and Aaron—set off on a mission to figure out the truth about his father and The Enemy. On the way, they meet powerful rivals and uncover some sinister secrets. I did find The Copper Gauntlet to be a slight improvement when compared to The Iron Trials, but only because there was more of a clear goal and a distinct plot. However, the adults were so incompetent that it was just ridiculous! The story's main characters are four thirteen-year-olds, and the school is filled with "powerful'" mages! 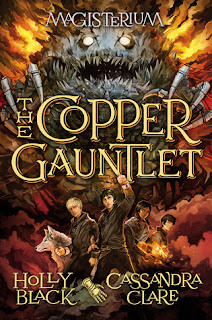 Call and his friends are constantly breaking the rules—they harbor a Chaos-ridden wolf, release an evil being into the Magisterium, and end up running away from the school entirely! Somehow, none of the adults even notice! In The Iron Trials, I found the friendship between Tamara, Call, and Aaron to be genuine, but it really headed downhill in The Copper Gauntlet. They act distant towards one another, and even reveal each other's secrets. Although Call becomes a much more likable MC than in the first novel, even that wasn't enough to make me enjoy this book or want to recommend it to others. 1) In the previous book, Call is annoying and complains about everything. He becomes a much more appealing character who actually solves his issues instead of whining about them. 2) There was actually a clear plot and goal, unlike in The Iron Trials. The plot comes together seamlessly and makes sense, which I obviously prefer to a jumbled and confusing storyline. 1) Again, the entire book feels like a re-make of Harry Potter, down to the characters and the plot! Tamara, Aaron, and Call are exactly like Hermione, Ron, and Harry. Jasper's personality is identical to Malfoy's, and there is even a flying car scene! Sound familiar? 2) Not only are Call, Aaron, and Tamara always breaking rules that could get them expelled (and aren't all that great at being discreet about it), the powerful mages at the Magisterium don't even notice any of it for over a year! 3) Unlike in the previous book, Tamara, Call, and Aaron's friendship felt completely forced. They are distant throughout the entire book, and Tamara gives away Call's biggest secret as soon as she finds out about it. 1) I don't know," Call said. He was starting to worry that there weren't any good guys. Just people with longer or shorter Evil Overlord lists." 2) "People like Aaron act all nice until suddenly they explode and banish some annoying geezer into the void." To be honest, Cassandra Clare is an author whose books I will not read anymore. I've hated all of them and I'm not really interested. I've heard this series is very similar to Harry Potter as well, and you just confirmed it again, so I will skip this. There's no point in me reading it. Yeah, I wouldn't recommend it. It was really similar to Harry Potter, and there isn't much of a point to reading a re-make. It's a shame that you didn't like The Copper Gauntlet! I was thinking about picking up the series, but I don't think I'm going to anymore. Thanks for sharing your thoughts! The series really didn't meet my expectations, and I wouldn't recommend it.